Therapy is not a matter of milestones, but of moments*. Those moments can be: awkward; intense; heart-warming; painful; shocking; surprising; happy; exhausting; revelatory; uncomfortable; thought-provoking; mundane; interesting; angry; fearful; beautiful. But there is nothing so lovely in therapy, I think, as moments of laughter. Particularly where that laughter is at an ‘in-joke’- amusing to the two of you by virtue of the intimate work you share in. I told my therapist that I had asked one of my children how he felt about a particular situation. He told me, and then said “was that the right answer?”. I replied that there was no right or wrong answer. As I related this story, I caught my therapist’s eye and we both burst out laughing, a split second apart. The irony hit me, as it hit her, and there was no need for either of us to explain what we found so amusing. My answer to my son was precisely the answer my therapist gives to me every time I worry that I am ‘not doing therapy right’. It was amusing for both of us to see me play her role, and pass on a wisdom I found it so difficult to apply to myself. There are so many intense, moving, and powerful moments in therapy, where we make ourselves vulnerable and feel ourselves drawn closer to our therapist. But shared laughter has a special kind of bonding quality. For that moment, you are precisely attuned; on the same wavelength. Your laughing together is only possible because of a shared emotional and intellectual state. So much of therapy is ‘unequal’, in the sense that you reveal a great deal of yourself, whereas the therapist reveals comparatively little. But shared laughter has a unique kind of mutuality. There is an added benefit to laughing with my therapist. I spend so much of my sessions avoiding eye contact – but when I laugh with her, I look at her. And that too, is another form of bonding and connection. That too, shortens the distance between us. Therapy is a matter of moments – and laughing together are amongst the moments that matter the most. * This is a twist on a quote by Rose Kennedy: “Life is not a matter of milestones, but of moments”. Categories: Therapy | Tags: borderline personality disorder, BPD, laughing with your therapist, laughter, laughter in therapy, therapeutic relationship, therapy | Permalink. When I was reading this post, I thought, ‘wait a minute, isn’t that the answer the Therapist gives?’ I think we hold the answers within to many of our dilemma’s and if Psychotherapy unlocks the unconscious, then it’s hardly surprising we will experience these ‘slip of the tongue’ moments. 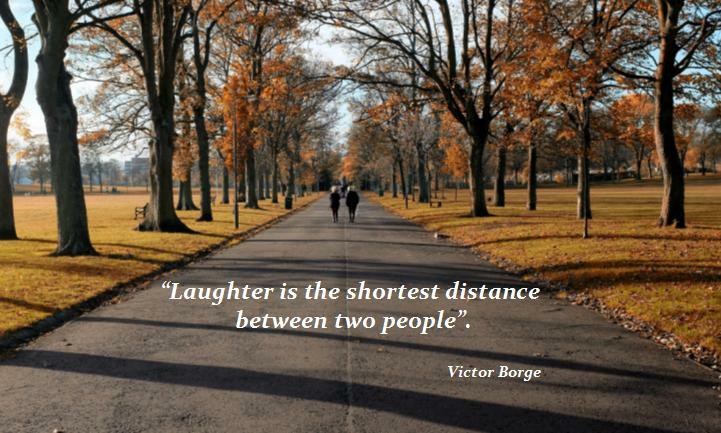 I also find eye contact difficult with the T, but sharing laughter does break down that barrier. Yes, I know every pair of socks he owns!!! Beautiful, and so true. Laughing with my therapist, and all those other tender intimate moments make all the hard, painful work worth it.